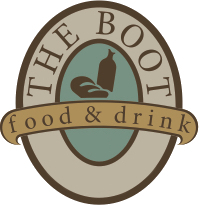 The Boot at The Grove is located off John Hawkin's Parkway in The Grove Shopping Center across from Target. The Grove location has a beautiful patio, large dining room, as well as a private dining space that seats up to ten. The bar features a rotating selection of six local beers on draft daily, craft cocktails, plus a fantastic wine selection. After dinner make your way to The Boot Scoop, located off the patio, for ice cream, shakes, and much more!